Calvinist is the story of a generation of young men and women who went searching for answers and found them in Reformed theology. I found this a fascinating film because what they discovered is what I've always had as my birthright. I grew up in a Reformed home, attended a Reformed church, and went to a Reformed school, and it was the same for most of my friends and family. 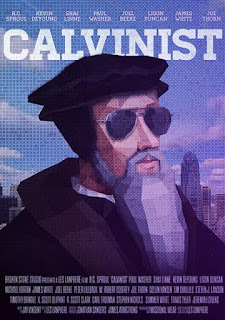 What was so very fun about Calvinist was the opportunity to see through new eyes, the knowledge of God that I had taken too much for granted. The "young, restless, and Reformed" were a product of the late 90s and early 2000s – they had questions, and the Internet gave them access to all sorts of answers. When they googled "How do I know if I'm saved?" or "How do I know the Bible is true?" the best answers they found were by Reformed theologians like R.C. Sproul, John Piper, John MacArther, and more. It is a history of how God steered this questioning generation towards just what they needed to know Him. Calvinist also shares many of the answers these seekers were after. Producer Les Lanphere went to today's biggest name Reformers and and hit them with some of the biggest questions. So, in addition to learning some recent history, the audience learns timeless biblical truths. That's an impressive, long list; Lanphere has put in the time and effort needed to make this a very special film. That extra effort also comes out in all the slick transitions and special effects – this looks good! One fun bit is running gag of sorts. Lanphere used 80s-era computer game style graphics to animate and illustrate some points. So, for example, when discussing Roman Catholicism's "faith plus works" position, we see what looks like an old arcade game, and scroll through some possible "fighters" until the selection stops on Martin Luther. An interesting tangent that's briefly explored is the impact Reformed Rap had on these young seekers. I watched this with a group of 20-somethings who had never heard of Timothy Brindle and Shai Linne and they were amused and maybe even a little shocked that "Rap" could be paired up with "Reformed." But is it really so surprising that a medium which gives primacy to the word would be a great one for communicating the deepest truths about God? While all the Reformed teachers we're introduced to are quite conservative, they do have some differences among them that aren't ever discussed. The most notable concerns baptism – there's a roughly 50/50 divide among the speakers, with half believing in credo-baptism (Piper, MacArthur, Durbin, White, Challies) and the other half, infant-baptism (Sproul, Horton, Trueman, Beeke, Godfrey). Other differences also exist, so while a discerning student can learn much from these men, discernment is indeed needed. I've shared this film with two different sets of friends and everyone has really enjoyed it. This will be a hit with anyone 18 and up who has an interest in Reformed Theology. It probably won't convince a non-Reformed friend, but it will probably give the two of you a lot to talk about and explore further. If you use it for a group movie night, consider having an ice cream and brownie break at maybe the one hour mark. There's just so much packed in here, that a break is needed to allow folks to think through and discuss what they've been seeing and hearing. You can check out the trailer below, and further down you can see two YouTube videos that are featured prominently in the film because of the impact they had on the young, restless and Reformed generation. You can buy Calvinist here. Sounds amazing! Thanks for the review.